In this area of the Apparel Search fashion brand directory, you will find children's fashion brands from leading apparel companies and fashion designers. On this particular page, you will find information regarding children's clothing with the Lucky Brand Jeans brand. You are welcome to utilize this section of our clothing guide to review Lucky Brand Jeans news, Lucky Brand Jeans blog posts, Lucky Brand Jeans photos, and more. Please understand that you may run into a few photos or a tad of information that does not actually pertain to the children's Lucky Brand Jeans fashion brand. Unfortunately, no search technology is absolutely perfect... We will continue to do our best to bring you as much information about the children's Lucky Brand Jeans fashion collection as possible. Explore the world of Lucky designs for the little ones you love most. Find stylish clothing for boys and girls. In 1978, Gene moved to enter into the Los Angeles fashion industry. With partner Michael Caruso he started Bongo and ran the brand for 15 years. After leaving Bongo, Gene teamed up with his old business partner Barry Perlman in 1990 to launch Lucky Brand. Gene & Barry created a brand that is known for the attention to detail put into each pair of jeans. This along with the stitching of "Lucky You" on the fly, accomplishes the goal that Gene & Barry set out to do; to create a product of good quality & good humor. 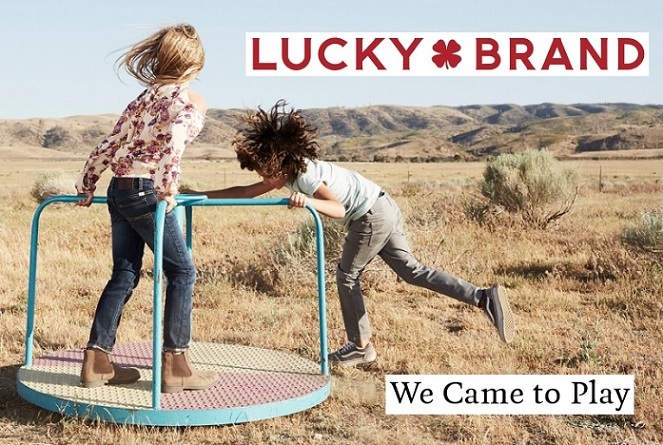 Learn more about Lucky Brand kids fashion. If you have changed your mind and do not wish to research the brand Lucky Brand Jeans, you can use the search engine on this page to find another clothing label that may be of more interest. Apparel Search is a leading guide to fashion, style, clothing, glam and all things relevant to apparel. We hope that you find this Lucky Brand Jeans page to be helpful.